We have all seen these recent pictures from the media this past week or two. The pictures of course make things look worse than they really are. The citrus growers, spray the groves with water to allow the water to freeze and actually protect the fruit from the below freezing temperatures. The ice hanging from the trees makes for some dramatic images. 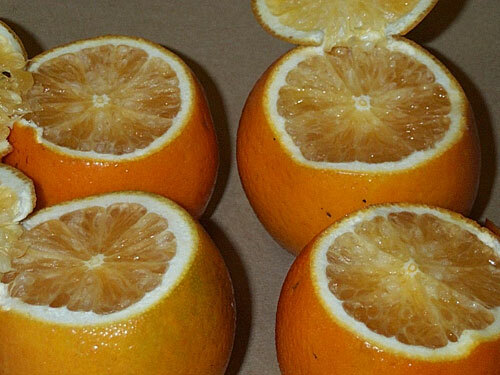 But the growers are anticipating some damage to their fruit and they are taking measures to ensure the damaged citrus does not reach the fresh market To read more about the possible damage to the citrus crop in California, please click here. All packing houses are conducting pre-harvest inspection to determine the extent of damage and some packing houses have installed scanners in the packing houses that can detect freeze damage. But if, by chance some freeze damaged citrus reaches your warehouse you must cut the fruit to determine the presence of freezing injury. The injury will be found towards the stem end of the fruit, and will appear either granular or dry in appearance. To read how to score this defect, if you do come across it, please click here. 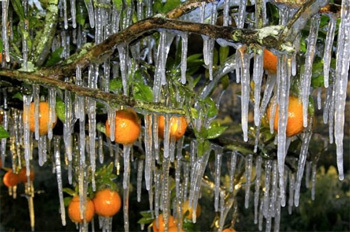 But unfortunately the freezing damage is not limited to citrus. The vegetable growers in California and Arizona now have to contend with problems in their fields too. Lettuces, such as iceberg, romaine, and leaf lettuces are very susceptible to freezing injury. Freezing injury, commonly referred to as epidermal peel, will the be main defect you should keep an eye out for. The outer layer of the lettuce will freeze, thus killing the cells of the outer leaf or leaves. This results in a peeling or feathering of the outer layers. There are two things to remember if you find peeling and feathering on iceberg lettuce. 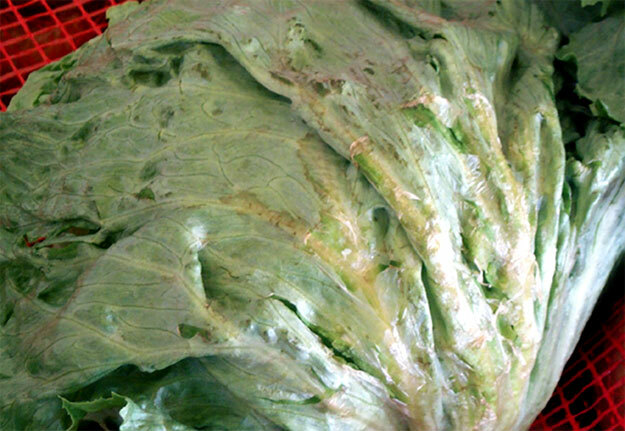 If the lettuce is peeling, but not discolored the USDA has issued a very lenient scoring guideline. It will be scored as a defect, as damage, when affecting more than 75% of the surface area over the crown on more than 2 head leaves. By stating the peeling and feathering must extend at least three leaves deep it pretty much means you will never score this as a defect. But, if you find discoloration along with the peeling and feathering the defect is scored in much stricter manner. The USDA states this is scored as a defect when the yellow to brown discoloration affects more than 50% of the surface area over the crown. The lettuce shown above would be scored as a defect. To see a previous post regarding field freezing affecting romaine, please click here.